SUNDAY!! 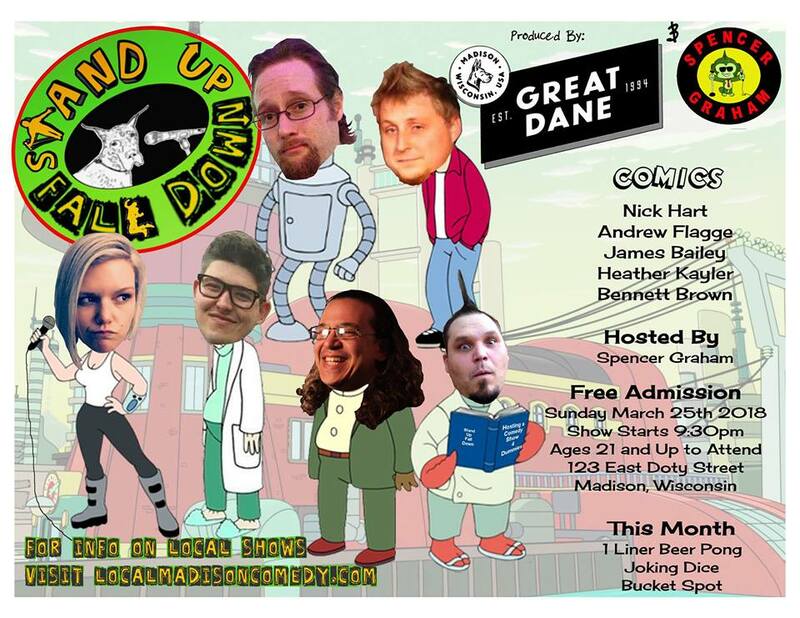 Take your nearest mass transit option down to The Great Dane Pub & Brewing Company's rathskeller bar, and enjoy the comedic styling of some of Madison's best and one of Milwaukee's! Come enjoy the refreshing Great Dane brews, food, and laughs. We will be joined once again by the 2017 Madison's Funniest Comic Nick Hart. Andrew Flagge will be traveling in from Milwaukee for his second experience. Bennett Brown from Backdoor Comedy Showcase will be joining in the fun. James Bailey and Heather Kayler will be making their first appearances. It will be a great time you will remember a number of years into the future. We will be starting the show off with some 1 Liner Beer Pong and the comics will be playing some Joking Dice. Remember, always Stand Up when you cheers, and never drink so much you Fall Down!